When I was brainstorming for today, I found myself searching for things that would be meaningful to our incoming class. It was suggested to me that I simply reflect on my own time in my white coat this past year rather than make efforts to impact any wisdom, aka ‘survival techniques’. I’ll start by saying that I’m not really a fan of the white coat itself. I think it gets in the way, it’s not very comfortable, and it just makes me feel stiff. However, what is symbolizes outweighs these initial thoughts. When you don the white coat, you are accepting to be held to a higher standard, responsibility, commitment, and an ability to put yourself second until you take it off at the end of the day. It didn’t take long to realize that I desired these things and that they are a large part of ‘why’ I chose to attend PA school, to be able to use them to help people in all aspects of their lives. My most memorable time in my white coat thus far occurred in our first semester and solidified for me that we can do so much more than treat a diagnosis on a chart. Some of you have already heard this, but I feel it’s worth sharing again. The patient was a mother; however, she had brought her son along to her appointment. She was worries about his behavior recently both at home and school. She described him as “angry all the time”, during the discussion of her visit. Dr. Richards sent a classmate to get me and asked me to come to the room with my hair down. Initially, I thought this was an odd request because in a year of shadowing him [prior to starting the MPAS program] he’s rarely seen me with my hair down and certainly never asked me to take it down. I entered the room much like I look today and immediately realized why he had made this request. The patient’s son was sitting in a chair with his own long hair down and wearing a Led Zeppelin or Guns-N-Roses t-shirt – I can’t remember which, but I was impressed with his taste. We spent the next 15-20 minutes talking about how it felt at that age to have different interests than your peers (T-Swift, J-Biebs, or Mumble Rap). As the conversation went on you could feel some of the tension lift from the room as he began to share more. This encounter had nothing to do with traditional medicine but was surreal for me. I left that room feeling as if I’d made a difference simply by related to him. I remember thinking, ‘that’s what this is about.’ And, there it was again… my ‘why’. Emory & Henry offers several things that encouraged my decision to attend. First and foremost, the ability to learn hands-on by seeing patients from the start of our didactic coursework. This time at the Mel Leman Free Clinic was an irreplaceable experience as we began to cultivate both our diagnostic and patient interaction skills. I cannot count how many times we’ve learned something in class which has then been reinforced by seeing patients in the Clinic. Not only is this a great reinforcement tool for our studies, it also boosts confidence, pushes us to learn more, and gives us memories of first patients. I can recall how we treated my first hypertensive, hypothyroid, or diabetic patient far more easily than the lectures on these disease states. A second aspect of E&H that drew my attention was the instruction dedicated to behavioral medicine. This knowledge is paramount to employ as practitioners in every patient visit. Lastly, as an alumnus of E&H and a member of the Southwest Virginia community for the last decade, I knew that this program and its students would be warmly welcomed. Not only have its members been encouraging us in our education, but they have participated in many ways. This is a community where patients have chosen to let us learn with them and from them starting on our first day on campus. And, any community with an investment in me as a person is one I want to give back to, one I want to make proud… yet again, my ‘why’. In closing, I want to share a quote that resonated with me throughout the past year: “Never confuse a single defeat with a final defeat (F. Scott Fitzgerald).” This has served as a reminder to me to look towards the end game, to focus on winning the war despite the battles lost. For some of you, this may be the first time you experience academic difficulty. For the next year, sleep will be scarce, hours will be long, and at times it may feel like it’s just too much. It is those moments that I hope you can look at this White Coat and be reminded of your ‘why’. Thank You. Dr. Jim McDowell, former Medical Director for the E&H MPAS Program. Dr. McDowell is Always Present to Support the College, the Program, and the Students. Annually, the MPAS Program holds its White Coat Ceremony at the beautiful, historic Lincoln Theater in downtown Marion, VA.
Dr. Scott Richards, Chair/Director of the MPAS Program, addresses the audience at the inaugural White Coat Ceremony for the MPAS Program Class of 2019 inaugural White Coat Ceremony held at the Lincoln Theater in May 2017. 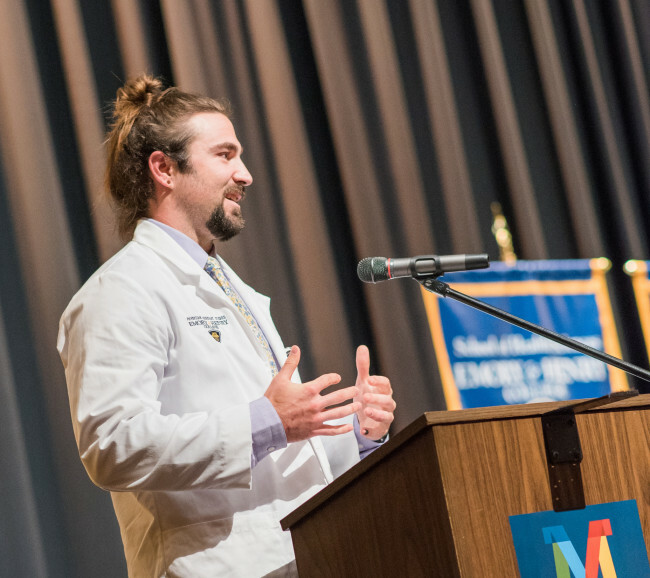 President Jake Schrum, E&H College President, addresses the audience at the inaugural White Coat Ceremony for the MPAS Program Class of 2019 inaugural White Coat Ceremony held at the Lincoln Theater in May 2017. Dr. Lou FIncher, Dean of the E&H School of Health Sciences, addresses the audience at the inaugural White Coat Ceremony for the MPAS Program Class of 2019 inaugural White Coat Ceremony held at the Lincoln Theater in May 2017. MPAS Class of 2019 students participating in community service: here, students are assisting Prof. Harry Howe’s Project Crossroads organization in preparing flood-relief supplies for residents in southeastern U.S. affected by recent hurricanes. MPAS Class of 2019: Taking a break from classes to celebrate Halloween PA style! Met Gala Ticket: In April 2018, the E&H MPAS Class of 2019 helped to host the Mel Leaman Free Clinic (MLFC) Met Gala to raise money to support the facility and the health care needs of the community. This was a formal evening of live jazz music, hors d’oeuvres from local food establishments, and drinks. The event was an incredible success with more than $4000.00 of donations raised for the MLFC - and a great night out for the students, their families, and the community. Despite their incredibly busy schedule and packed curriculum, the Class of 2020 students found the time to take a break and enjoy halloween - PA style! Student cohort details comparison between Class of 2019 and Class of 2020 including age, gender, ethnicity, GPAs, GREs, direct patient care hours, shadowing hours, volunteer/service hours, type of degree and student attrition from program.